In our previous newsletter, we promised some great stories and examples of Zentangle inspired art. 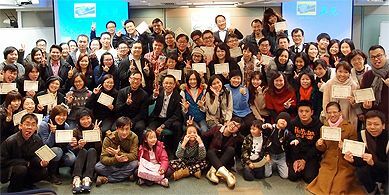 We are honored to share them with you in this newsletter. We so appreciate everything that people send us. 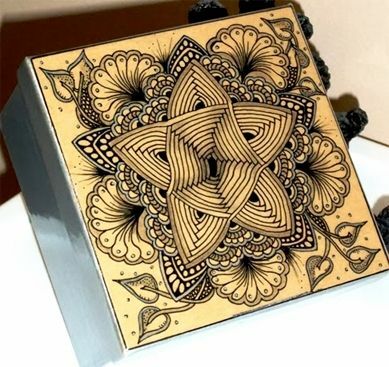 It is uplifting to see what you create and both exciting and humbling to read about the impact that the Zentangle Method and art form is having in peoples' lives. Here are just a few of such comments and contributions. All emphasis is ours. I bought the [Zentangle Apprentice] Classroom Pack #1 and I have started teaching it to my students who are at various levels of Special Ed. I have been teaching for 25 years and the frustrations of imparting difficult art concepts seem to have disappeared using the Zentangle system. I thought you might like this story. Every year, after Christmas lunch, we sit down as a family and create a small canvas tile together. Each year there is a theme or a medium we all use. Last year it was buttons and trees, the year before animals we have seen on Christmas Day. 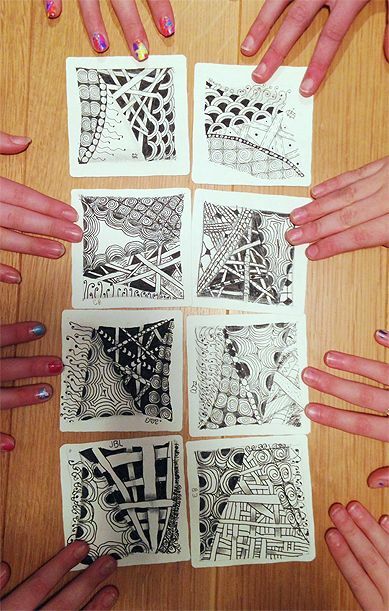 But this year the memory of 2013 was discovering Zentangle! It was so peaceful tangling to the sounds of the Australian bush. Merry Christmas to you all. I have six grown up children and this year they all got a Zentangles kit for Christmas, even the daughter who lives in Canada. I love spreading the Zentangle message and am really looking forward to the CZT course in June. I thought you might want to see this. Anna is a ten year old who took a class from me in August. 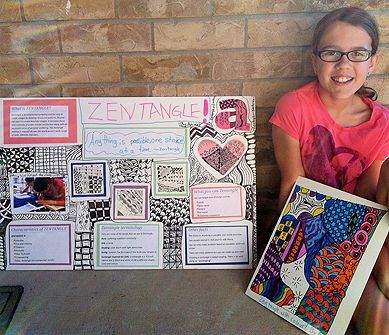 She loves doing Zentangle and her mom sent me this photo of her display for her school. She got a lot of positive feedback on it from students and teachers alike. Pared down to its barest essence, wabi-sabi is the Japanese art of finding beauty in imperfection and profundity in nature, of accepting the natural cycle of growth, decay, and death. It's simple, slow, and uncluttered-and it reveres authenticity above all. Now, when I look at this little box, I will visualize my "trials and tribulations" simply as beautiful imperfections and thereby reach that state of wellbeing. Just a note to thank you for sharing your talents which provide so much inspiration, creativity and joy. The deconstruction of tangles...that opened my eyes big time...countless "AHA!" moments...so much so, that I had to sit back and stare, hold the paper up and...stare, analyse... wow! Having been an oil painter for 30 years (mostly dog portraits), drawing always evaded me. Zentangle, drawing the step outs of the tangle deconstruction and...shading...has allowed me to just begin to draw other 'things'. 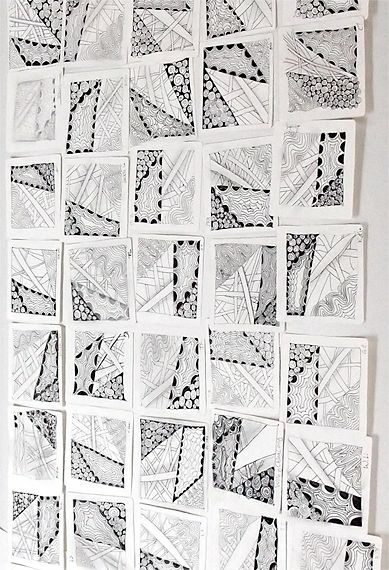 I owe it all to Zentangle, as nothing [else] 'worked' for me since childhood. Two years ago, I became familiar with your unique art form. It has allowed me such relief and comfort from my pain. Time is lost while I am tangling. Time that never seemed to move in the past for me. I thank you so much! 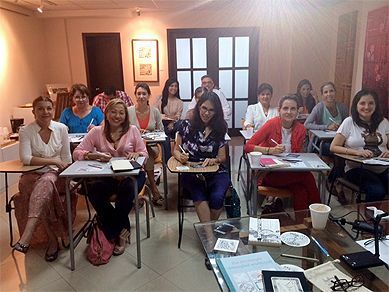 I hope everything is great, I wanted to tell you that I am giving my 8th Zentangle seminar and people love it. 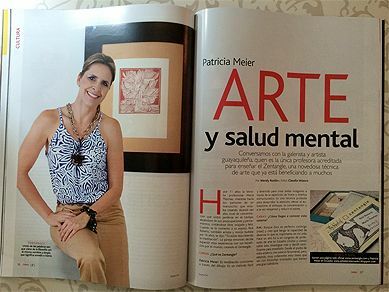 I would like to send you a magazine where they made me an interview about Zentangle. It is very nice and everyone is very interested. 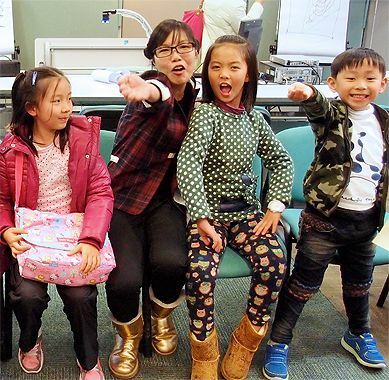 Elsewhere on this globe, Fina Man, CZT, holds Zentangle classes in Hong Kong. Here she is with a few young Zentangle artists! More and more we consider the Zentangle Method and art form as a type language. Those last two images certainly "speak" to that idea! 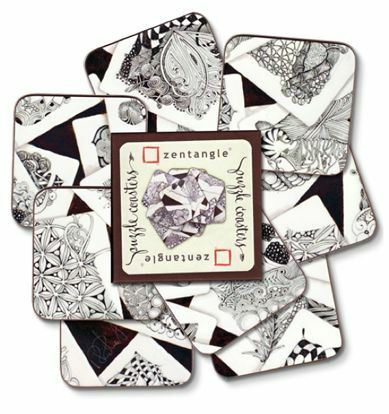 Zentangle Coaster Puzzle Set - Last Call! Just want to give you a heads-up that when this batch of our Zentangle Coaster Puzzle Set sells out we will remove it from our store. 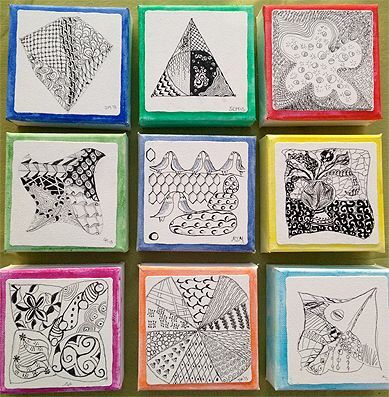 The Zentangle Coaster Puzzle consists of nine coasters covered with original Zentangle art by Rick and Maria. This set combines beauty and challenge in a fun and functional work of art. They can only be assembled in one way. It's not as easy as you might think! Keep your table clean and your guests entertained! 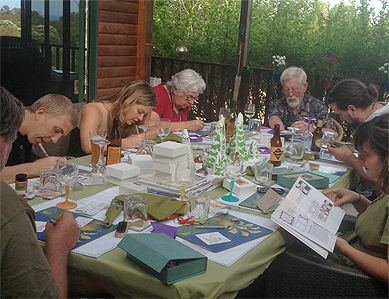 If you are interested in attending our Certified Zentangle Teacher (CZT) seminars in 2014, please register quickly to hold your place. Seminars are filling quickly and some are already into a wait-list. Links to each seminar are on the left side of every page of our website except for the home page. For more information on our CZT program, see this link. We look forward to meeting you and working with you! Thank you to all who so generously share their creativity and comments. And thank you to all of you who enjoy it with us.